Mention French jeweller Van Cleef & Arpels, and one is bound to think of its iconic Alhambra motifs, its proprietary Mystery Set — where gemstones are mounted on thin gold rails instead of using prongs, so they look like they’re floating — or its long-standing relationship with the world of dance. But equally important and emblematic to the brand is its signature Perlée jewellery collection, which comprises versatile and elegant jewels embellished with dainty golden beads. Created in 2008, the line includes bracelets, rings, pendants and earrings, all of which are handcrafted with sparkling beads. For 2017, Van Cleef and Arpels has added a new bracelet and ring to its Perlée range. Available in three sizes, the bracelet is composed of five rows of yellow gold beads, which have been set close to each other for a striking, three-dimensional effect. A single, larger gold bead acts as its clasp. Behold the new Perlée ring and bracelet. Match it with the new Perlée ring, which sports a similar silhouette but with three rows of beads. It may appear simple at first glance, but try it on, and you’ll find that the cluster of shiny beads creates a clean and effortlessly sophisticated look. For a more luxurious and eye-catching aesthetic, we suggest snagging a few more rings and layering them on your fingers. Like the other Perlée jewellery designs in Van Cleef & Arpels’ repertoire, all of the beads in the new ring and bracelet are individually and strategically hand-polished for the ultimate shine. This attention to detail also extends to the underside of the jewels, where the yellow gold has been mirror-polished till it gleams. 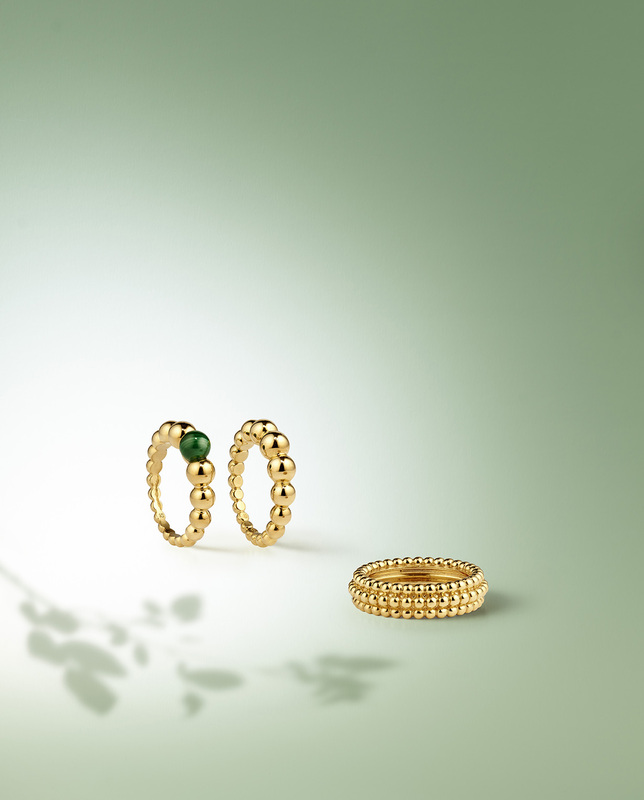 From left to right: Perlée couleurs variation ring in yellow gold and malachite, Perlée pearls of gold variation ring in yellow gold, and Perlée pearls of gold ring with three rows of yellow gold beads. 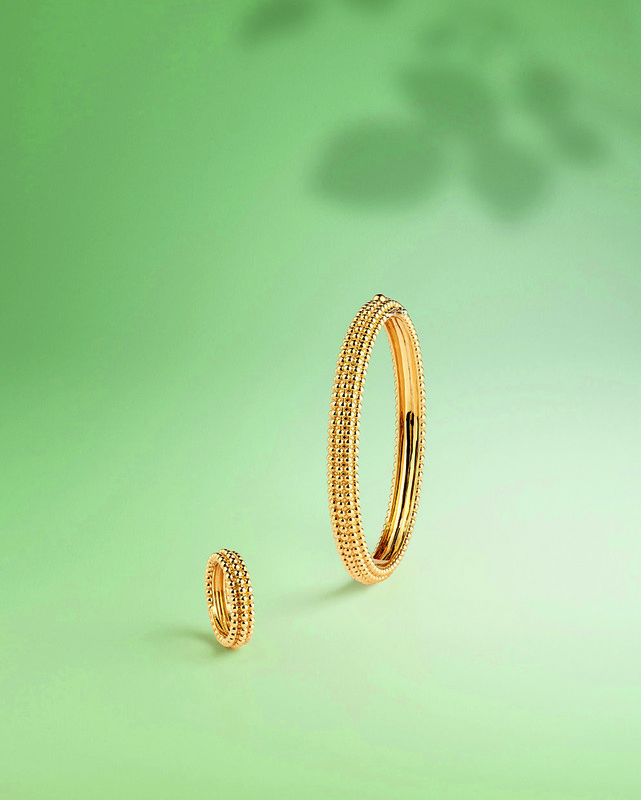 The Perlée jewellery collection isn’t the first time that Van Cleef & Arpels has used gold beads in its pieces. The brand has, in fact, been incorporating this motif in its designs since the 1920s, when it added beads as a border around gemstones and patterns. In 1948, these lovely spheres made appearances in necklaces, earrings and watches in the Couscous line, and from 1963 onwards, were set in braided shapes and paired with other materials such as pearl and coral. Their newest iteration is manifested in the new Perlée jewellery pieces, and we’re certain these designs will remain equally classic and timeless for decades to come.